WINTER IS COMING! Jk it's actually fall, I'm just having intense withdrawals from Game of Thrones being done for the season. Anyway...The coming of a new season means new trends, and boy do I have the must-have for you this fall. So without further ado, let's get into what you should be wearing on your feet for stepping into this fall season. Now you guys know that it's not secret but...I love shoes, like I'm a shoe-aholic. It's honestly such a problem, but with shoes like I'm about to show you, you will understand my addiction. If you've been keeping up with the latest shoe trends, you'll know that embroidered shoes have taken the fashion world by storm. From embroidered sandals, to slip-ons, to sneakers, embroidered shoe wear has shown itself to be the way to express your creative sense of style. 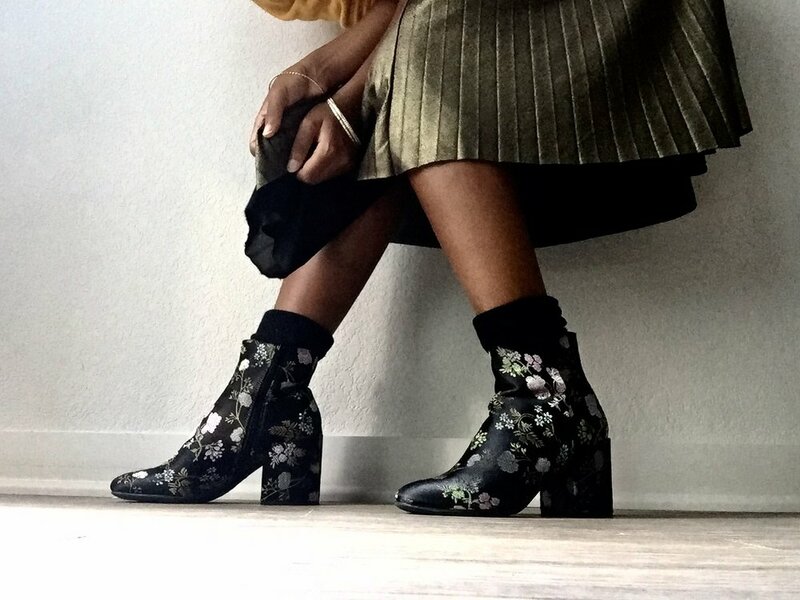 This trend is continuing into the fall by introducing embroidered booties! And let me tell you, they are all truly magnificent and a must-have for every self-proclaimed fashionista. The ones that you see me wearing in the picture are a pair of Carlos Santana booties that I ended up finding for a steal at Ross (which is surprising because I rarely ever find anything there). This just goes to show that you don't have to break the bank to have this fun item in your closet. The reason why I love these shoes so much is because even though they are embroidered with flowers, the base black color of the shoe itself allows me to where this with multiple outfits. So I suggest that if you want to participate in the trend, but you aren't sure if you could wear them in everyday situations, then I suggest making sure that they have a muted base color (either black, grey, white or may be a deep brown) so that you won't be trying to style colors an patterns. But if you are into going all out, then I suggest getting a color. Burgundies and crimsons are taking charge as a beautiful background for embroidery on these shoes, and many shoes outlets have such styles available.